Since the 1994 elections South Africa has had a massive increase in the demand for power as millions of people who previously had no access to power were brought online together with a number of massive building projects which have been completed over the same period.. The authorities have instituted a number of novel ideas to solve the problem. They demand that consumers use less power and if this does not work they simply use a rolling blackout strategy to cut off the electricity supply to certain areas while the demand is too high. This strategy is totally unsatisfactory as it switches off the power supply of businesses and hospitals leaving them in the dark and unable to operate. No forward planning has been done by the authorities and yet their top brass have been paid massive bonuses over the years. The realisation that we do not have enough power stations has hit home and after years of squandering the electricity supplier has no cash to build new power stations. Now that the crunch has arrived their way of solving the problem is to request government to increase the cost of electricity by 60% so that they can put together enough capital to build more power stations which of course will take another ten years to come online. Although the authorities have done nothing some independent companies here in the Cape have got together and have researched the use of windpower and have obtained permission to erect a wind farm on the hillside farm of Windhoek. 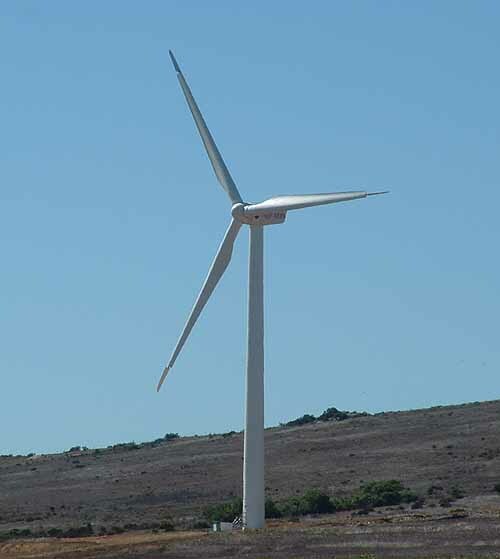 Over the past month or so four 50 metre turbines each with three 28 metre blades have been erected on the farm overlooking the Atlantic ocean near Yzerfontein. The power generated by the Darling Wind Power company will be distributed via the national grid to willing buyers, who will elect to buy the clean energy at a premium "green tariff" of 25 cents more per kilowatt hour than coal-fired electricity. This wind-generated electricity will be measured separately so as to meet targets of companies buying green energy. The authorities will provide audited "green certificates" to companies purchasing the green energy. For the moment the ordinary man in the street in Cape Town will not have access to this power but might eventually become customers, as growing environmental awareness increases residential demand for clean and sustainable energy. 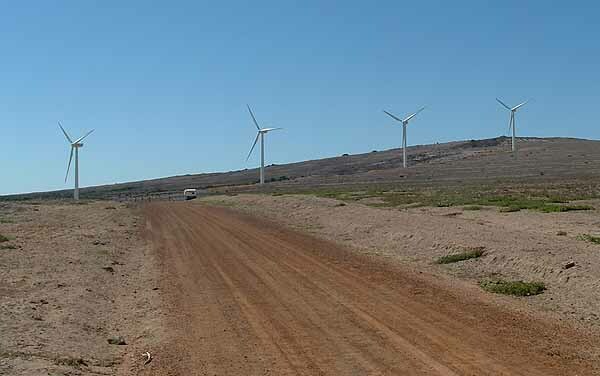 While all the planning of the Darling Wind Power was going on Eskom quietly erected a pilot wind turbine project near Klipheuwel which ran from August 2002 to the end of 2005. Eskom however were not too enthusiastic about the prospect of wind power in South Africa as they felt that the wind resource here in Cape Town is moderate when compared to Northern European conditions and that wind farms would only be able to operate at a capacity ranging between 15 to 25 percent compared to the 30% experienced in Europe. 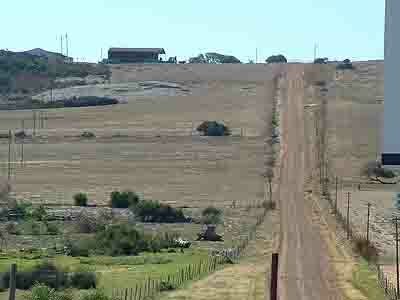 The CEO of the Darling wind farm says that his facility will have a maximum capacity of 34%. We will just have to wait and see who is correct. Cape Town has a lot of wind, the south easters in the summer and the northerly winds in the winter and between them there is enough wind to turn the turbines almost every day of the year in my opinion. I'm sure that the Darling wind farm will be a great success and that their plans to increase the number of turbines to twenty in due course will alleviate some of the power shortages we are experiencing here in the Cape. Want to see these new wind turbines in action? Why not take a tour up the west coast next time you visit Cape Town.